As we move through October and toward the end of the year we hear more and more about Windows 8 and Windows Phone 8. Microsoft has recently made a bunch of announcements surrounding the Surface tablet, so here I am... jumping on the bandwagon. 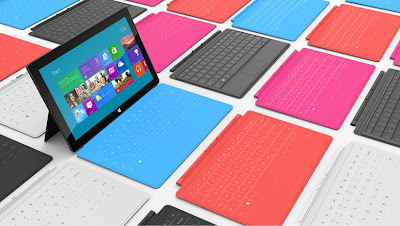 We learned that the Surface will have an RT version that will compete with the iPad and Android tablets and that there will be a Pro version that will provide the full Windows experience and more of the business features. There will be 32 and 64 GB versions and you can get the devices with and without those cool keyboards. We've also been told more recently that the full version of Microsoft Office 2013 that is included on the RT Surface is not licensed for use by businesses. This means that if you want to use your Surface RT at work you'll need an Office 2013 Pro license at work. You shouldn't need to reinstall software (don't quote me on that), but to be compliant you'll need to be covered with an Office 2013 business license. If you're in the Microsoft Volume license program and have a work computer with Office 2013 you may have a multiple device license already... in which case you should be covered. Talk to your Microsoft reseller or Partner for more about that. Another tidbit... Microsoft is opening a number of new temporary stores for the holidays this year... which should make it even easier to get your new copy of Windows 8 or to score a Surface tablet! 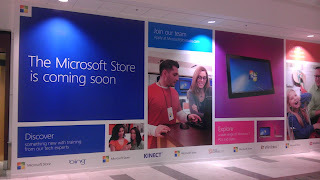 Check out the Microsoft Store locations, including the holiday stores here. Here's where Office 365 comes in... if you have one of the new Office 365 subscriptions being released early next year you'll also be covered for Office 2013... since it is included with your subscription. So, there's yet another good reason to look at Office 365. And, I just learned today that if your company has an Enterprise Agreement with Microsoft for licensing and you add Office 365 to your EA that you may be able to get a MAJOR discount on the per-seat cost of migrating to Office 365. Talk to your Microsoft Partner for more information about the various incentives that are available to you. Will Office365 work on Surface RT? You are aware that the Office 2013 Pro edition only works on Surface Pro, correct? The RT Office is Home & Student edition, without Outlook. Surface RT's also cannot join a domain, although you can use Remote Desktop. Surface RT comes with Office 2013 Home & Student. It is licensed for use in the home, not at work. That means that if you want to use it at work you need to have an Office 2013 license to cover it there. That doesn't mean you need to reload the Surface with the pro version though... only that you need to have a license. It's not like the Surface will know you took it to work or anything so this is an "on your honor" license issue. With regards to Office 365 working on the Surface RT, absolutely! Just keep in mind that since Office 2013 Home and Student doesn't come with Outlook (Outlook is a business product according to Microsoft) you'll need to use another e-mail client. You can use Outlook Web Access or download a third-party product like Touchdown for e-mail access. You could also probably use the built-in e-mail app on the Surface although it wouldn't give you the full functionality of Outlook.